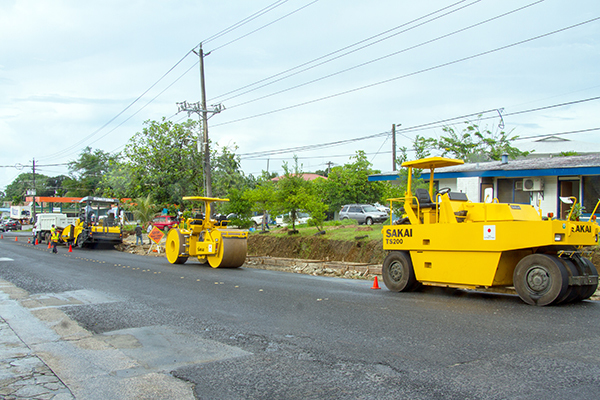 Pohnpei—This morning the Japanese Embassy officially turned over road paving equipment to the Pohnpei Transportation Authority (PTA). The donation of the two rollers and an asphalt finisher and their spare parts were worth approximately 41 million yen (approximately $376,000 USD). In accepting the donation from Japan, Acting Governor Reed Oliver promised that the equipment would be maintained. He fluidly spoke the Japanese language when he thanked Ambassador Ryoichi Horie for the donation of the people of Japan to the people of Pohnpei. 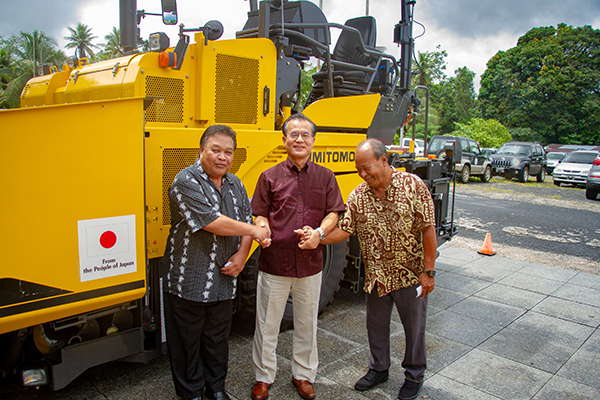 Before turning over the symbolic keys to the equipment to the Acting Governor and the Pohnpei Transportation Authority, Ambassador Horie said that he hoped that the donation would help Pohnpei to maintain its roads. He also challenged the Pohnpei Transportation Authority to maintain the new equipment. Though the equipment was officially turned over today, two weeks prior to the turnover, PTA had already used the equipment to repair streets in Kolonia that had been damaged during the heavy rains that caused mudslides in Pohnpei in late March. Ambassador Horie witnessed some of the repairs that PTA was able to accomplish in Kolonia because of his country’s donation to Pohnpei.